Live the experience of a lifetime: discover the wonders of the coral reef under the guidance of a fully certified scuba Instructor. Try Scuba Diving in the Cayman Islands without the hassle of getting a diver certification. Ocean Frontiers Dive Shop is an Authorized PADI 5 Star Dive Center located on the East End of Grand Cayman. All of our Dive Instructors are Certified by PADI and teach to strict PADI Worldwide safety standards and procedures. If you can swim, enjoy life and are at least 10 years old, you are just one step away from enjoying our underwater paradise in the Cayman Islands. 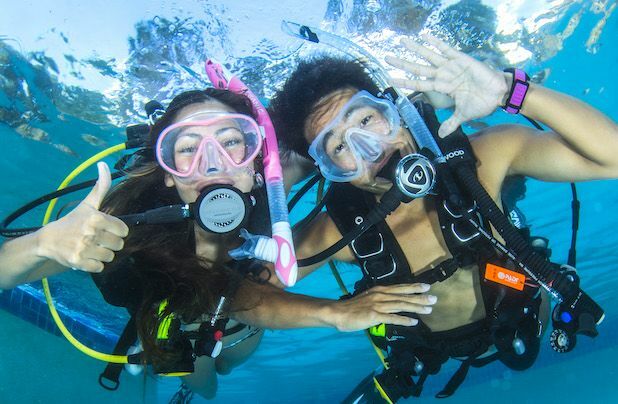 Going on a PADI Discover Scuba 'Resort Course' dive is a great way to find out if you like Scuba Diving and for most people it opens their eyes to amazing underwater world! Diving in the Cayman Islands is super easy to do and only requires the ability to swim (and of course passing the medical exam!). On our website on the downloads page, there is a scuba diver medical form. If you answer yes to any of the questions you will need a signed note from a doctor in order to go on the scuba dive. If all is well then you are in for a new diving adventure! The PADI Discover Scuba 'Resort Course' consists of a short training video, an introduction by your dive instructor, a true or false quiz and off you go to our diver training pool to practice a few scuba skills. You and the dive instructor will work with you on your scuba equipment so you are comfortable and before you know it, you are breathing underwater! Once that is accomplished, you will go to a shallow dive site and swim among the fish and see our beautiful coral reefs. The scuba dive lasts about 30 to 40 minutes depending on your breathing rate. PADI Resort Course Schedule: 1/2 Day Experience, available all year round. The 'Resort Course' can be completed in approximately 3-4 hours and includes a 1 tank boat dive to a coral reef. Maximum ratio is 1 PADI Instructor to 4 Students. Note: The Term 'Resort Course' and 'Discover Scuba Diving Course' mean exactly the same thing and are just 2 different names used in the dive industry and both are used interchangably. PADI is a worldwide scuba diving training agency that is responsible for setting industry standards for diver training. PADI is an acronym for Professional Association of Dive Instructors. Once you complete the PADI Resort Course and see what you've been missing, you can come back day after day for more diving fun. Or go all the way and join a PADI Open Water Certification course and look forward to a lifetime of underwater adventure! Repeat Resort Dives do not require you to repeat the classroom or pool training session, but do require you to be directly supervised by a Dive Instructor or Divemaster while Scuba Diving to a maximum depth of 40 feet.